One of the things we love about blogging here at I Love Biking SF & Oak is being able to connect with the bike community about issues that are important to bicyclists everywhere. Every once in a while, we get a message in our inbox that really stands out to us. 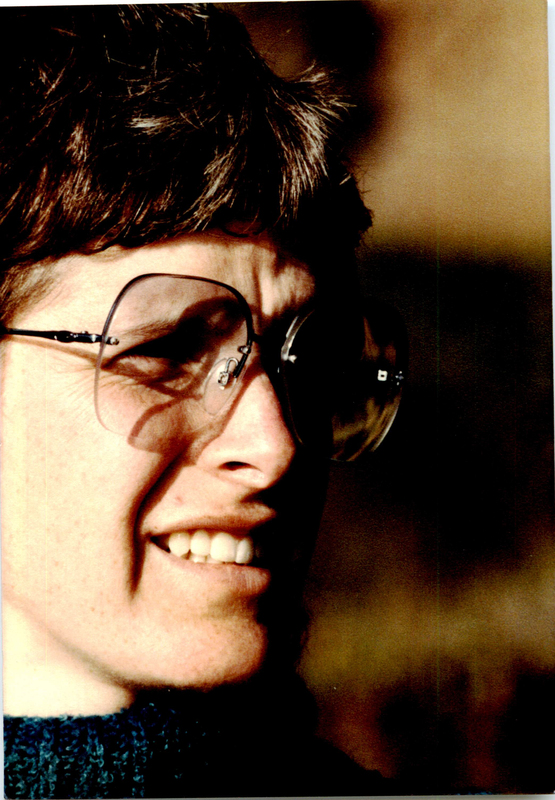 Recently, we received an email by a gentleman named Doug Bowman who knew Susan Watson. He kindly sent us a lovely photo of her from back when he was close to her in the 70s and wrote some beautiful words about her. We have shared them below. Thank you Doug for giving us all this special glimpse into another part of Susan Watson. 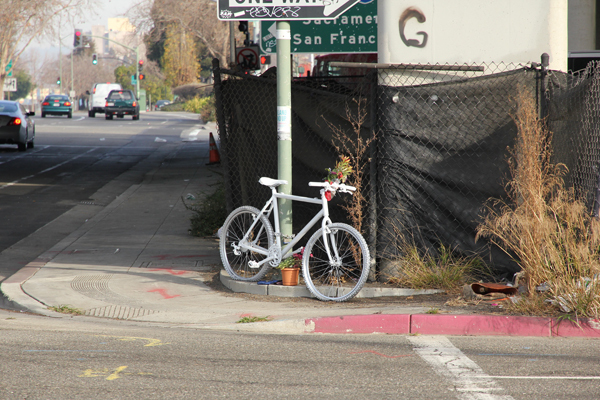 I went back to the location of Susan’s collision (Market and 5th St. in Oakland) to investigate and I saw that a ghost bike was placed there for her. Below are the photos I took of it. Going there again along with info from recent news reports, I got more insight into how the collision happened and will be writing my thoughts about it in an upcoming post. 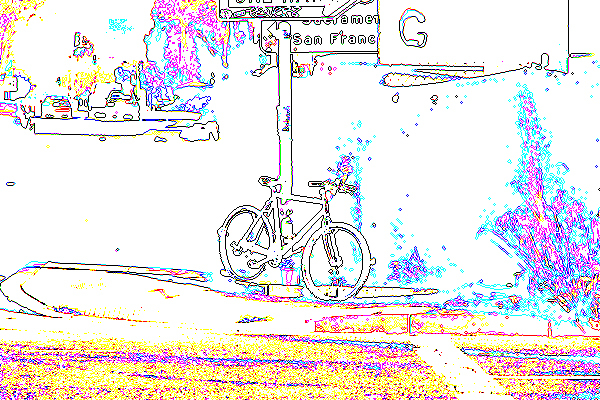 Susan’s ghost bike at Market and 5th St. In my last post, I talked about how nice the ferry ride is. Part of what makes the ride nice is that you get to ride with other bicycle commuters. We all commute from different parts of Oakland but join at the ferry terminal. We all know when it is time to get off the ferry by seeing others put on their helmets and gloves. That is when you know that the ferry is about to land at the pier. Then, we would line up to get off the ferry after all the non-bike passengers exit first. That’s our routine every day. Bike helmets on, then gloves, turn on our bike lights, and wait in line patiently. There was this one lady in her 50s (62 y.o.) whose bike was decked out with lights – MonkeyLectric lights on the wheels, lights on her backpack, and both front and rear bike lights. We all recognized her by the Stegosaurus-like spikes that decorated her helmet and she liked to wear a red jacket. She was always smiling and chatting with everyone of us. Her name was Susan Watson. She’s a scientist that worked at a small biotech in South San Francisco. That is the little info I know about her. Well, today she wasn’t on the ferry. I had read the horrible news this morning and had a thought it might have been her, but I wasn’t certain. The mystery of this lasted until this evening when we waited to get off the ferry- this gentleman told me and the rest of us that Susan just got into a bicycle collision with a truck driver. It’s heartbreaking. She had all the lights and safety measures correct and was even riding in the bike lane on Market St. The truck driver still didn’t see her and killed her. What else can bicyclists do to stay safe?! It’s up to the city and the drivers out there to look out for us! I will update if I find more info about her. Rest in Peace, Susan… We will miss you. We put together this video to capture the spirit of Susan’s memorial ride last Friday evening. We were so impressed with all the people that came out for her and to show support. We hope that positive changes will come out of Susan’s death. Once again, a huge thanks to all those who helped make this memorial possible. Lorn and Owen for building the ghost bike and setting up the event, Robert from the EBBC for advising, supporting us, and helping to get the word out, Chris from WOBO for advising, Wilson for helping us get the word out to all the folks at the East Bay Bike Party, Scraper Bikes for coming out and showing support, Denise at Banh Cuon Tay Ho Restaurant for accommodating us for dinner after the event, all the friends, family, and co-workers who knew Susan and others who came out that night for her and to support the cause. You guys are awesome! There is an inexplicable feeling of camaraderie among the bike community that I hope shines through in this video and in all that we do. We are so glad to be a part of this great and growing bike community. Please forward this video to anyone who knew Susan or that you think might be interested. Be safe, ride well, and ride every day! We want to remind you guys that the Memorial Ferry and Bike Ride for Susan Watson is this Friday, 1/17. Details about the ride can be found in our last post. Also, we made this flyer, below, that we are going to be handing out to participants and bystanders. Its purpose is to introduce people to Susan Watson and call attention to bicycle improvements. Please feel free to print some to hand out yourself or use in your own publications, etc. Thanks to some wonderful organizers, there will be a memorial ferry and bike ride to honor fallen bicyclist Susan R. Watson while calling attention to bicycle infrastructure improvements. Please join us on the evening of Friday, January 17th as we start by taking our bikes aboard the 5:20pm ferry from Oyster Point in South San Francisco (the ferry Susan used to take) and landing at the ferry terminal in Jack London Square in Oakland. Those of you who cannot take the ferry can just meet us at Jack London Square where the ferry will land at 6:00pm. 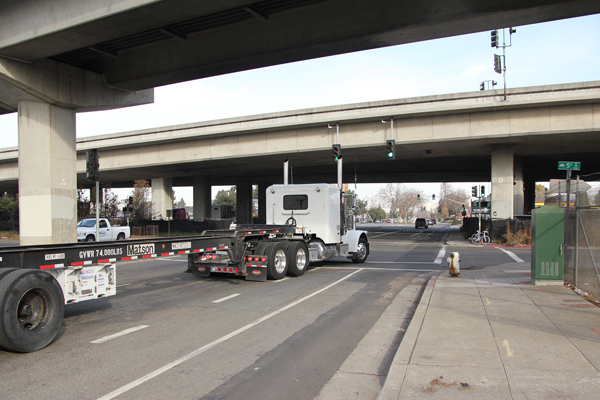 From there, we will then ride along a planned route which will increase our visibility to truck drivers coming from the Port of Oakland. Please make and have signs asking for truck drivers to ‘Share the Road’ and also asking the city to do more to improve bicycle safety and infrastructure. Our ride will stop at the corner of 5th and Market which is where Susan Watson was killed. 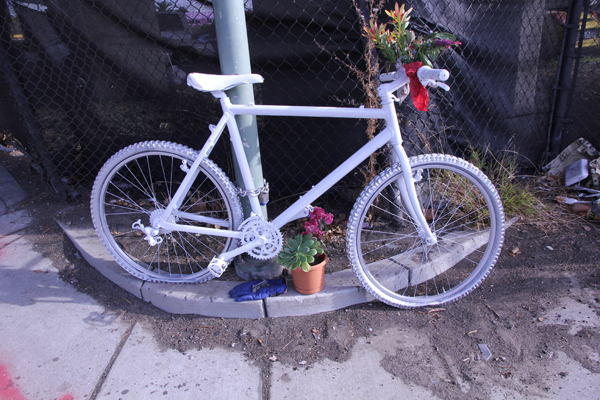 We will visit her ghost bike, say a few words, place candles and flowers, and clean the area around her ghost bike. “While this will not bring Susan back, we have to celebrate her and do our best to improve on the conditions that resulted in her not being here any more. After the ceremony, those who want to can join us as we make our way to the Vietnamese restaurant Banh Cuon Tay Ho (344 12th St. between Harrison and Webster Sts.) in Oakland’s Chinatown for dinner. The restaurant is a bicycle-friendly business and offers a 10% discount if you come with your bike helmet. There is also plentiful bike parking on racks in front of the restaurant. The route map is here. Special thanks to Lorn and Owen for setting this up, Robert from the EBBC and Chris from WOBO for advising. In urban cities, over 50% of all collisions involving bicycles are at intersections. Up to a third of all bike collisions involve heavy trucks, despite there being less trucks on the road than passenger vehicles. These two statistics help paint a horrifying picture of how a lot of bicycle collisions happen. In most bicycle collisions involving trucks, the bicyclist is usually heading straight when an oblivious truck driver makes a right turn and “right-hooks” him or her. This past August in San Francisco, Amelie Le Moullac, a 24 y.o. woman, was killed exactly this way. This time was no different in Susan Watson’s death. Susan Watson, a dear and wonderful friend to many, was riding on Market St. in Oakland after getting off the ferry at Jack London Square on Monday evening, December 17th, 2013. She was a dedicated bike commuter on her way to her home in El Cerrito, about 9 miles away. The shortest route with some sort of bike facility for her to take was northbound on Market St. and she wore all the things that would make a cyclist visible to drivers in the evening hours: an assortment of flashing and colorful wheel lights, bike lights, and lights decorating her backpack. She would have known that this route, close to the Port of Oakland, is often filled with trucks- even more the reason to have so many lights. Her route going home has bike lanes in both directions, but it is also a favorite route for truck drivers coming in and out of the Port of Oakland to pick up and drop off all those cargo containers (see the stack of Matson containers in the image below). Anyone who rides a bike can tell you that large trucks are the scariest things on the road (aside from maybe aggressive and impatient taxi drivers), but the city decided to put bike lanes there anyway, sharing the truck route without doing anything more than painting white stripes. Obviously, doing only that much wouldn’t and doesn’t work and this setup hasn’t worked in San Francisco either. 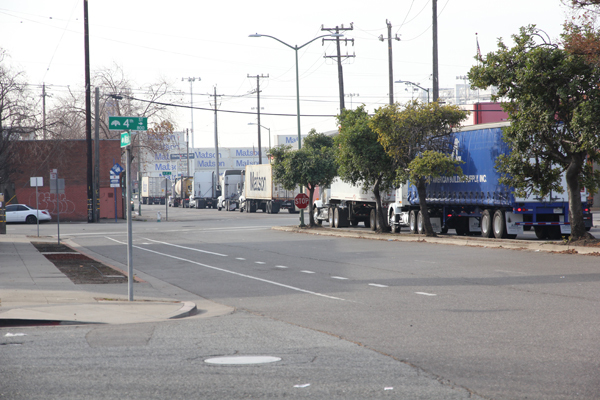 Looking southbound on Market St. near 4th St. – You can see that this street is filled with 18 wheelers. 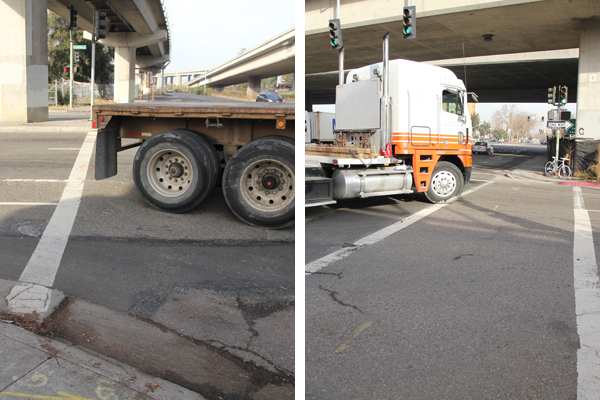 Trucks come and go on this route because of its vicinity to the Port of Oakland and the nearby freeway entrances and exits (see image below). 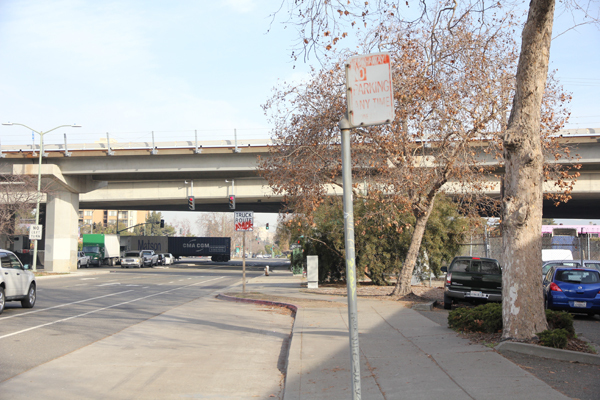 Looking northbound on Market St. near 5th St. – Truck drivers’ preferred route to get onto the 880 freeway. Furthermore, when I was taking photos at this intersection, I saw that over 95% of the truck drivers did not merge to the far right before making a right turn (see image below). Although that would require trucks to merge into the bike lane before executing the turn, this is what they are supposed to do. Trucks need to do that so bicyclists and everyone else can predict where they will go and not think that they are going straight instead of turning. Also, it will keep bicyclists from treacherously ending up in their right-side blind spot. Why aren’t truck drivers merging all the way to the right before turning? There’s definitely still enough room to make a right turn if they do so. This is probably so they can make wide turns which would also require less effort than having to merge to the right and then make a tight right turn. Another truck driver is not merging to the far right before making a right turn. In the image below, you can clearly see that the rear end of the truck is far from the corner curb. The front wheel axle barely turned. Another reason why truck drivers might make such wide turns is to avoid the tail-end from hitting curbs, light poles, and pedestrians waiting on corners, etc., but does it warrant such a wide turn? I have seen big rigs make tighter turns than this. Almost every truck driver makes a right turn this wide, with the rear end far from the curb. Another reason for such wide right turns is so that after making the turn, the truck would not end up outside the boundary of the road he or she is turning onto. However, at this intersection these truck drivers clearly have space. The photo below shows that 5th St. is so wide, almost 4 lanes wide in one direction (including street parking space), that there is actually room for truck drivers to make tighter right turns. Tighter turns would mean trucks would have to merge to the far right, crossing over into the bike lane before turning, which would also mean that the driver would more likely see a bicyclist in the bike lane where Susan was located at the time of the collision. Why such a wide turn when there is so much space? Do truck drivers do this so they can more easily position themselves on the farthest left lane on 5th St. so they can get onto the freeway ramp a few blocks down? To me, they just seem carelessly lazy. 5th St. is a wide street: 4 lanes wide (including the parking lane). Whether or not such wide right turns are indeed necessary at this junction, traffic engineers must design it better and also wherever there are bike lanes sharing the road with heavy traffic and in close vicinity to mass transit stops (in this case, the ferry terminal in Jack London Square). Better and adequate street lighting in the right places, which it currently does not have (see photo below). For some strange reason, the street lamps are placed away from the sidewalks on the median island, so that means that they will not really light up the curbs and sidewalks. This is pretty darn silly if you ask me. Why would street lamps be placed in the center of a road when pedestrians and bicyclists need it the most? 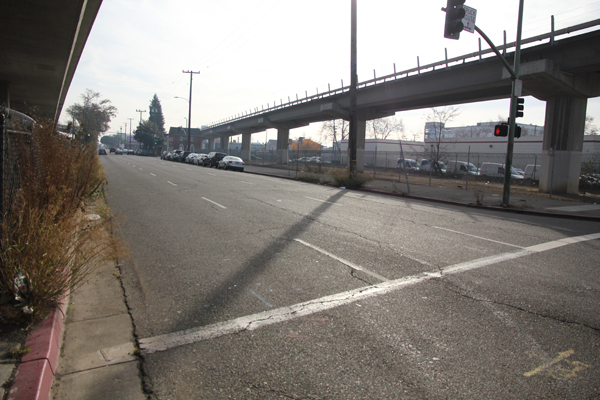 Moreover, this junction is partially under a BART bridge and so needs more lighting than usual. In addition, I think a bicycle alert signal placed near the intersection for alerting truck drivers of the presence of bicyclists is another good measure for safety. Speaking of lights, another thing they can do is have different traffic signal lights for both drivers and bicyclists at this kind of junction. Perhaps, let’s have green marked lanes such as green cross bikes all the way through the intersection. Of course, protected bike lanes are ideal but that is going to be perceived as too expensive and intrusive in our car-centric society. Instead, put buffered bike lanes in that stretch since there is no street parking allowed anyway (see image below) and there is plenty of space. That way, bicyclists are placed closer to the curb and away from the back end of trucks making right turns. This extra distance will allow them some space to react. No street lamps on the sidewalk. 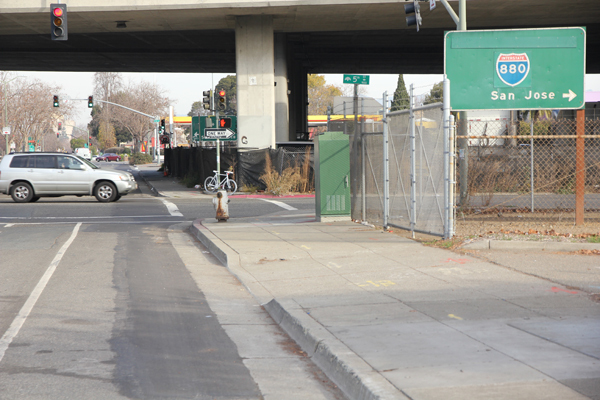 No street parking, so why not have protected and/or buffered bike lanes? To conclude, Susan’s death could have been prevented but a truck driver that night was too carelessly lazy and traffic engineers were too incompetent to see that what they put there is not enough to allow for the safe mixing of bicycles and trucks on open streets. They need to do more and they need to do it right.